Many conversations I have with companies considering doing some marketing revolve around tactical elements of marketing communications. Or more simply, marketing tactics. Tactics are the specific actionable element of marketing: direct mail, advertising, email, etc. Companies are often caught up by a specific tactic. For instance, they decide that the latest thing must be their thing. Or they will see a competitor doing something and determine they must implement that tactic as well. Getting fixated on a tactic can be very dangerous. Take Social Media as an example. Since Facebook started to attract millions of users, companies have been mesmerized by Social Media. The appeal is significant. First of all, it is “free”. Second, anyone can do Social Media. Best of all, there is no barrier to entry. Meaning it is easy to get started: consider the barrier to entry for social media versus the barrier to entry for sending direct mail. Determine content of direct mail. Find a mailing list of people or companies that might be interested. Print the mailer (and possibly) insert into envelope. Presto! You’re using Social Media for your business. Endless numbers of people can now see your page, profile or posts. Here’s a real-life example that isn’t about Social Media (because you can take about 30 seconds to find a company on Facebook that has two posts and one photo…from 2010 – maybe it’s your own). This example is about an earlier marketing “gold rush”. Back in the days of Internet 1.0, the owner of a distribution company caught the vision of Internet 2.0. Unfortunately, it wasn’t invented yet. He spent tens of thousands of dollars developing a website that took orders and promised immediate (via FedEx) delivery of large industrial equipment. The site worked because he made it work. It even had “videos” (this is in the day of modems, mind you), or rather multi-image sequences to show product features. Pretty cool. Too bad it was a total failure. In retrospect, Amazon took ten more years to convince people to buy a book online… why did an industrial specialty distributor think contractors would buy his products that way? He thought that because he became so infatuated with the tactic of marketing via the web that he forgot one critical fact: his customers weren’t ready to buy that way. It turned out he was about 15 years ahead of the curve. I’d call that bleeding edge. It significantly impacted his company’s profitability. His focus got off the real goal: selling product and onto a marketing tactic. Whatever the specific tactic is, it is a real problem for a single tactic to be the focus of your marketing. Don’t fall for this myth of marketing: we can do one thing! Make sure your marketing is a solid mix of tactics that is thoughtfully planned and appropriate for your target market. Need help choosing your marketing tactics? Contact us! More a do-it-yourself marketer? Sign up for our marketing blog email and buy Genius! Marketing book. ‹ Genius! 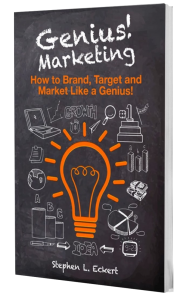 Marketing: The Book!